East Fife's final away game of the season ended with a 1-0 defeat to Albion Rovers. East Fife's season continued to peter out with this defeat in Coatbridge. The performance was certainly an improvement on last week's 5-0 hammering to Arbroath, but still wasn't enough to help them secure three points against a side in a desperate battle to beat the drop. Rovers are locked in a two way scrap with Queen's Park to avoid automatic relegation and at least give themselves a chance of staying up through the play-offs. And it showed at Cliftonhill, with the hosts racing out of the traps quickly, imposing themselves high up the park on East Fife and grabbing an early goal through Sean Higgins. It proved to be the matchwinner with both sides enjoying decent spells on top but unable to breach each other's goal. The Fife support expected a reaction after last week's hammering and they at least got that. Chris Duggan looked lively up front, having a couple of chances blocked and a decent penalty shout snubbed. Aaron Dunsmore also went close for the Fifers. One slip up could have cost Rovers dear but, to their credit, there wasn't really a nervousness about their play and they themselves could have grabbed that all important second goal through Graeme Holmes and Daniel Baur. 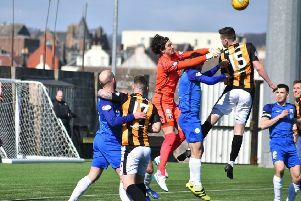 Both nets stayed untroubled and East Fife will end their campaign with a dead rubber match against Stranraer on Saturday. “The start we made was terrible and gave them something to hold onto. “That was the only shot they had in the first half and we had a couple of attempts ourselves. “The second half we were probably the better team, were at it and worked hard for the ball. “Nothing really fell for us but at the same time you have to try and make things happen." Albion Rovers: Wright, McLaughlin, McMullin, Perry, Baur, Holmes (Watters 89), Maclean, Davidson, Higgins, Trouten (Victoria 38), Scullion (McLeish 69). East Fife: Goodfellow, Dunsmore, Watson, Page, Allardice, Livingstone, Thomson (Knox 73), Millar, Slattery, Duggan, Jones.